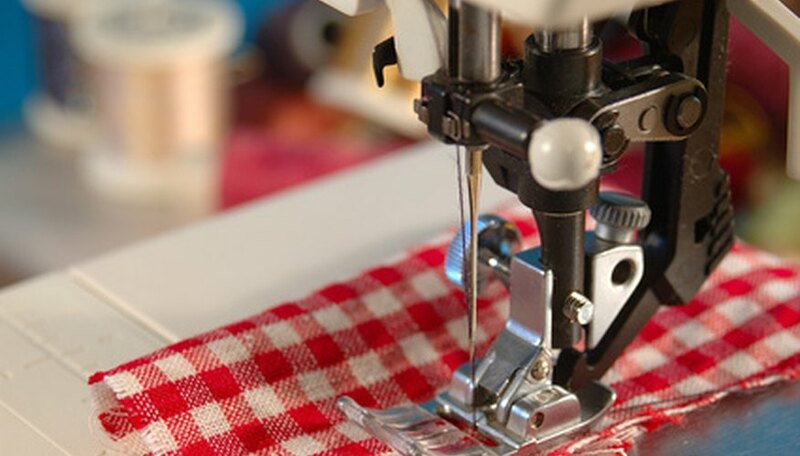 Sewing may sound like a frugal craft, but if you purchase new high-end fabric and trims, your sewn items may cost more than if you bought them at a bargain store. This is fine if the crafting is the purpose, but if you're looking to save money by sewing gifts and home decor, use recycled materials. Search your house for unwanted fabric items that you can transform into craft projects, and you can make creative fabric items for free. Homemade curtains are among the simplest of sewing projects, perfect for the beginning sewer. They do, however, usually take a large amount of fabric to complete. Use unwanted sheets, cutting out the most worn parts in the middle, and find large expanses of colorful breezy cotton fabrics. Piece together two different sheets for a creative patchwork or striped effect, or simply use sheets to match the room for a coordinated look. Turn a worn-out pair of jeans or corduroy pants into a timeless styled purse. Cut off the legs right at crotch level, and sew across the bottom to create the purse body. Make hemmed strips for straps and slip them through the belt loops to close the purse top. Decorate the purse with embroidery, patches or rhinestones for a creative personalized touch. Cut squares from flannel fabric in worn-out plaid shirts. Sew the squares together into a large rectangle. Sew two rectangles like this and sandwich them around an old, worn-out blanket. Seam the edges closed, or sew them and let them fray for a rustic look. This throw will be warm on cold winter nights. Stitch closed the armholes and neckline opening on a T-shirt that has a memorable design on front. Stuff the closed shirt with other old shirts, rags or polyester stuffing. Sew the bottom of the shirt closed when the shirt is completely stuffed, then display your T-shirt-shaped pillow on your child's bed or playroom shelf. Cut off one leg of a worn pair of pants. Sew one end closed, then gather the end with a ribbon or cord. Fill the sewn leg with sand and sew the top closed. Gather the fabric of the top in the same manner as you did the bottom. Lay this draft dodger in front of outer doors to help prevent cold air from seeping into the room during winter weather.